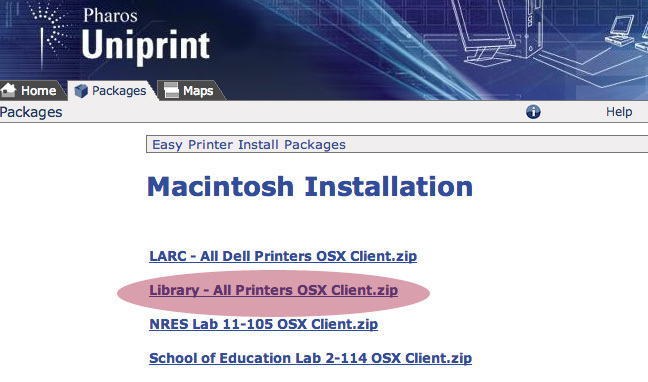 You have many printing options at Kennedy Library, including 14 laser-printers and access to specialty printing. See the links below to find out how you can print, where to find copiers, where you can send a fax, or how to access a scanner. There are 14 PolyCard printers located in the Library (see map). 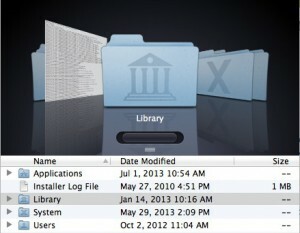 They are accessible from any public Library computer, including checkout laptops. Print jobs can be picked up from any of the PolyCard printers in the immediate vicinity. Laser printing is available using PolyCard Campus Express account. 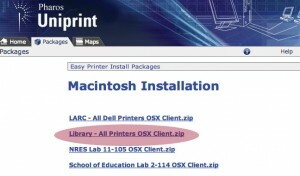 Printing on library lab computers defaults to double-sided, black-and-white prints. 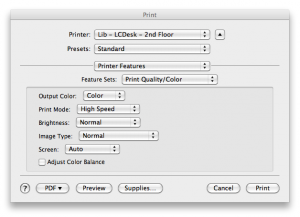 Print defaults can be changed in the print dialog box to color or single-sided as needed. PolyCard printing requires that you have money in your Campus Express account, accessed by using your PolyCard. Plus Dollars are for dining only and cannot be used for printing. You can add value to your card by logging into your Cal Poly Portal using a debit or credit card. Visit the PolyCard web page for more information. The PolyCard printing service is operated by ITS (not Kennedy Library), and delivers non-profit printing services to students campus-wide. ITS works with the campus fee committee to determine the “break-even” cost. Contact the ITS Service Desk at (805) 756-7000 for additional information. Printer ink faded? Paper jam? We know that your document may not always print out perfectly due to printer issues. You can fill out a request for a print refund here. Read ALL instructions before clicking on links. This will save you lots of time! b. Launch the Uninstaller application found in /Library/Application Support/Pharos/Utilities. 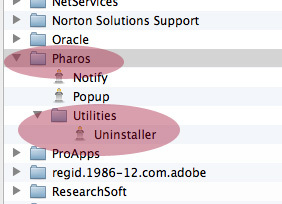 c. Select the components to be uninstalled (Pharos Popup), then click Continue. d. A list of the selected items will be shown. Click Continue. 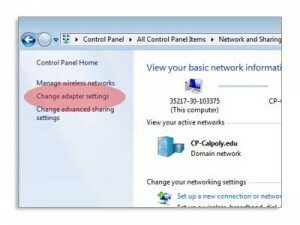 Be aware: You may need to enter an Administrator password for your laptop to uninstall the driver. This password is probably NOT your Cal Poly password. 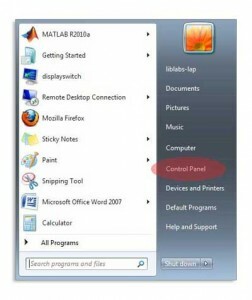 The appearance of the File menu or the process to send a document to the printer may vary depending on the application you are printing from. 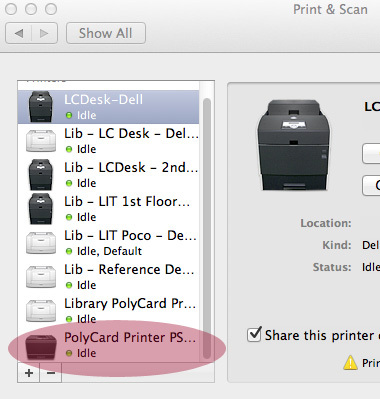 Select the “PolyCard Printers — Library” printer from the print dialog box and click “Print”. 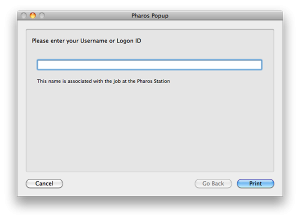 After sending the job to print, a Pharos Popup dialog box will appear and ask for a username or ID. Enter your username or name your document and click “Print.” This name will be used in step 4 to help you identify your document in case other people have submitted documents for printing at the same time. Step 4. Release the print job. Proceed to a printing station and release the print job with your PolyCard. Instructions for this process are located at each individual print station. NOTE: You really do have to read the instructions for this install. 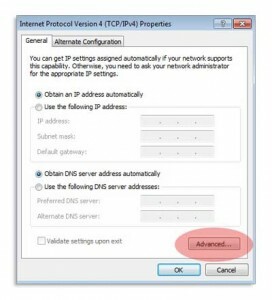 You may need to change the DNS suffix list … so pay attention and read the instructions before you download the driver. 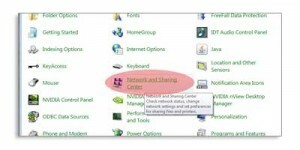 Windows 8: You can download printer driver to a Windows 8 computer though some settings and screens may look different. In the DNS tab, click on “Append these DNS suffixes.” Add “cp-calpoly.edu” and “calpoly.edu” and “lib.calpoly.edu” to this list and put in the order shown below. Run the executable, choose to Install. 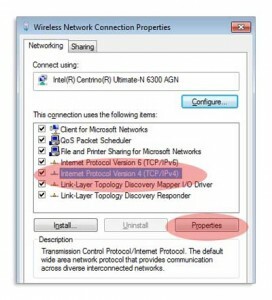 Follow the prompts and close any Endpoint popup windows. 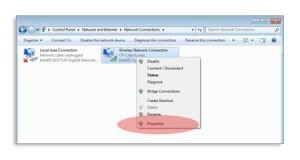 Print a test page to check functionality. 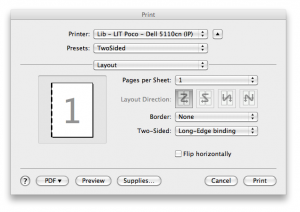 Printing from Library computers defaults to double-sided, black-and-white prints. If you need help, go to the Research help desk or the Poly Connect lab for assistance. Kennedy Library is pleased to partner with Cal Poly Print & Copy located in Hub24 on the first floor. Cal Poly Print & Copy hosts a specialty-printing lab which can print letter-sized, one-color projects as well as full-color, oversized print projects. Cal Poly Print & Copy also services and maintains copy machines throughout the library. These machines take cash only (no PolyCards). In addition to printing services and copiers, Cal Poly Print & Copy also has a Fax machine for campus use. Visit their walk-up window for more information. There are four scanners located on the second floor behind the Research help desk on the 2nd floor. These flatbed scanners can handle documents up to 11″x17.” Scanned documents can be saved as PDFs or JPGs and then saved to a USB drive or sent via email. 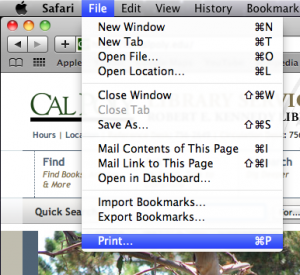 Cal Poly Print & Copy can also scan documents up to 11″x17″. Wonderful Monday! It's 1:09pm right now.